Monday was the graduation day for the final year students on the different mathematical undergraduate degrees that our school teaches. 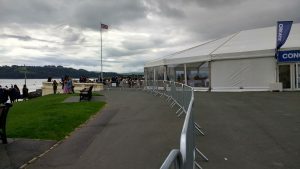 The event is held on the beautiful Plymouth Hoe. Although the sky was overcast, there was no rain. There are few more pictures on the facebook page for international students. In total 64 students graduated this year. There were 21 students who obtained a first class degree and 17 students obtained a 2.1 class degree. We wish our graduating students well in their future careers.